Many worms that have been created are designed only to spread, and do not attempt to change the systems they pass through. However, as the Morris worm and Mydoom showed, even these "payload free" worms can cause major disruption by increasing network traffic and other unintended effects. 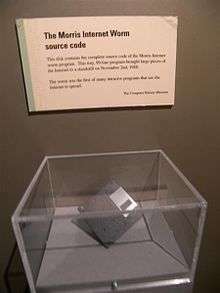 On November 2, 1988, Robert Tappan Morris, a Cornell University computer science graduate student, unleashed what became known as the Morris worm, disrupting a large number of computers then on the Internet, guessed at the time to be one tenth of all those connected During the Morris appeal process, the U.S. Court of Appeals estimated the cost of removing the virus from each installation was in the range of $200–53,000, and prompting the formation of the CERT Coordination Center and Phage mailing list. Morris himself became the first person tried and convicted under the 1986 Computer Fraud and Abuse Act. Probably the most common payload for worms is to install a backdoor. This allows the computer to be remotely controlled by the worm author as a "zombie". 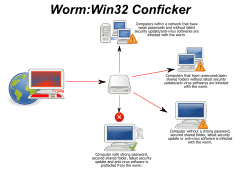 Networks of such machines are often referred to as botnets and are very commonly used for a range of malicious purposed, including sending spam or performing DoS attacks. In the April–June, 2008, issue of IEEE Transactions on Dependable and Secure Computing, computer scientists describe a potential new way to combat internet worms. The researchers discovered how to contain the kind of worm that scans the Internet randomly, looking for vulnerable hosts to infect. They found that the key is for software to monitor the number of scans that machines on a network send out. When a machine starts sending out too many scans, it is a sign that it has been infected, allowing administrators to take it off line and check it for malware. In addition, machine learning techniques can be used to detect new worms, by analyzing the behavior of the suspected computer. ↑ Barwise, Mike. "What is an internet worm?". BBC. Retrieved 9 September 2010. ↑ "Difference between a computer virus and a computer worm". USCB ScienceLine. ↑ Brunner, John (1975). The Shockwave Rider. New York: Ballantine Books. ISBN 0-06-010559-3. ↑ "Security of the Internet". CERT/CC. ↑ "Phage mailing list". securitydigest.org. ↑ Dressler, J. (2007). "United States v. Morris". Cases and Materials on Criminal Law. St. Paul, MN: Thomson/West. ISBN 978-0-314-17719-3. ↑ Ray, Tiernan (February 18, 2004). "Business & Technology: E-mail viruses blamed as spam rises sharply". The Seattle Times. ↑ McWilliams, Brian (October 9, 2003). "Cloaking Device Made for Spammers". Wired. ↑ "Uncovered: Trojans as Spam Robots". Hiese online. 2004-02-21. Archived from the original on 2009-05-28. Retrieved 2012-11-02. ↑ "Hacker threats to bookies probed". BBC News. February 23, 2004. ↑ "USN list". Ubuntu. Retrieved 2012-06-10. ↑ Sellke, S. H.; Shroff, N. B.; Bagchi, S. (2008). "Modeling and Automated Containment of Worms". IEEE Transactions on Dependable and Secure Computing. 5 (2): 71–86. doi:10.1109/tdsc.2007.70230. Archived from the original on 25 May 2015. ↑ "A New Way to Protect Computer Networks from Internet Worms". Newswise. Retrieved July 5, 2011. ↑ "Computer Worm Information and Removal Steps". Veracode. Retrieved 2015-04-04. ↑ "Virus alert about the Nachi worm". Microsoft. ↑ Al-Salloum, Z. S.; Wolthusen, S. D. (2010). "A link-layer-based self-replicating vulnerability discovery agent". The IEEE symposium on Computers and Communications. p. 704. doi:10.1109/ISCC.2010.5546723. ISBN 978-1-4244-7754-8. Worm Evolution, paper by Jago Maniscalchi on Digital Threat, 31 May 2009.